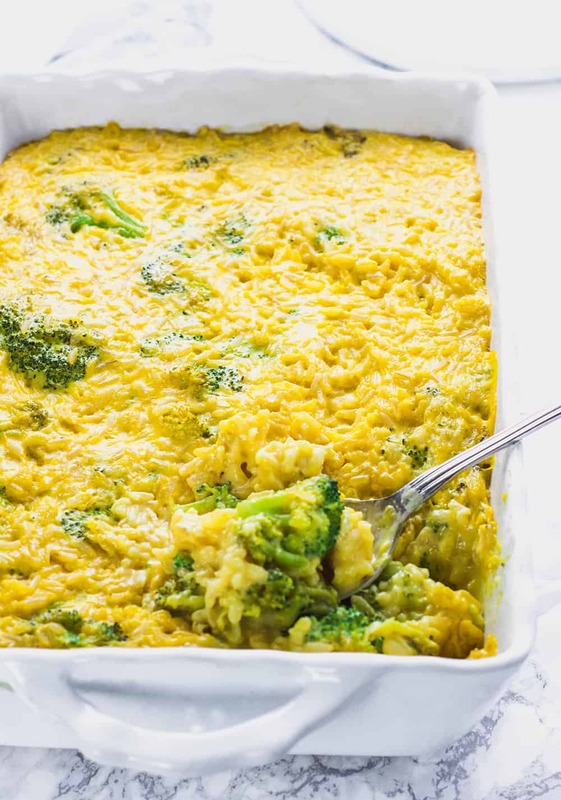 This Vegan Broccoli Rice Casserole dish is fit for special dinner, broccoli and brown rice smothered in creamy, cheesy sauce and baked until golden. It is so easy to prepare, healthy and so tasty! 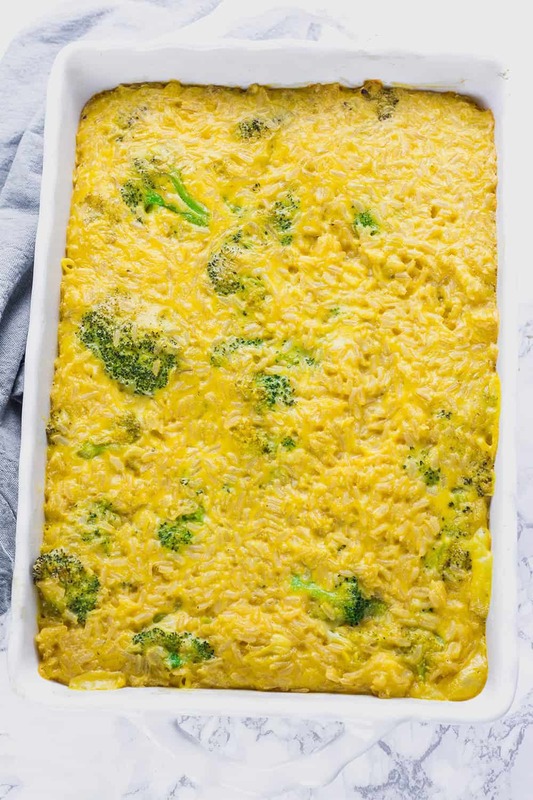 You can actually prepare the vegan cheese sauce for this Healthy Broccoli Rice Casserole, ahead of time and have this meal ready in no time at all. This recipe was originally posted on my website, June 20, 2013. It needed some facelift with new photos and description. Afterall it is a reader's favorite and it has withstood the test of time. 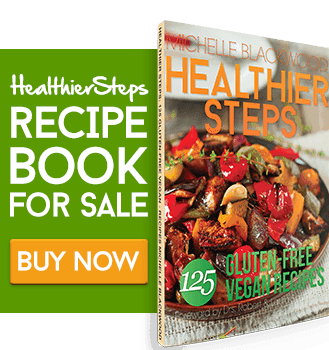 Definitely a classic Healthier Steps dish, so I haven't altered the ingredients. How to Make Broccoli Rice Casserole? If you are like me, I just love these easy to prepare dishes that can feed lots of people, you will have more time to focus on making a stew, salad, and dessert. 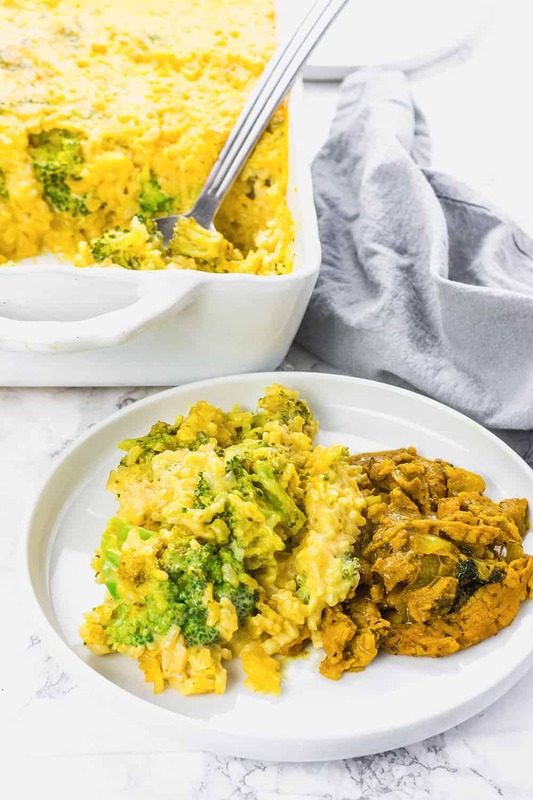 I find that one of my curry dishes, like my Vegan Chickpea Curry or Zucchini and Peas Curry, taste amazing with this easy vegan broccoli rice casserole dish. The flavor of the vegan cheesy sauce with the rice and broccoli gives a homecooked, comforting feel, brings back memories of my mom's cooking. 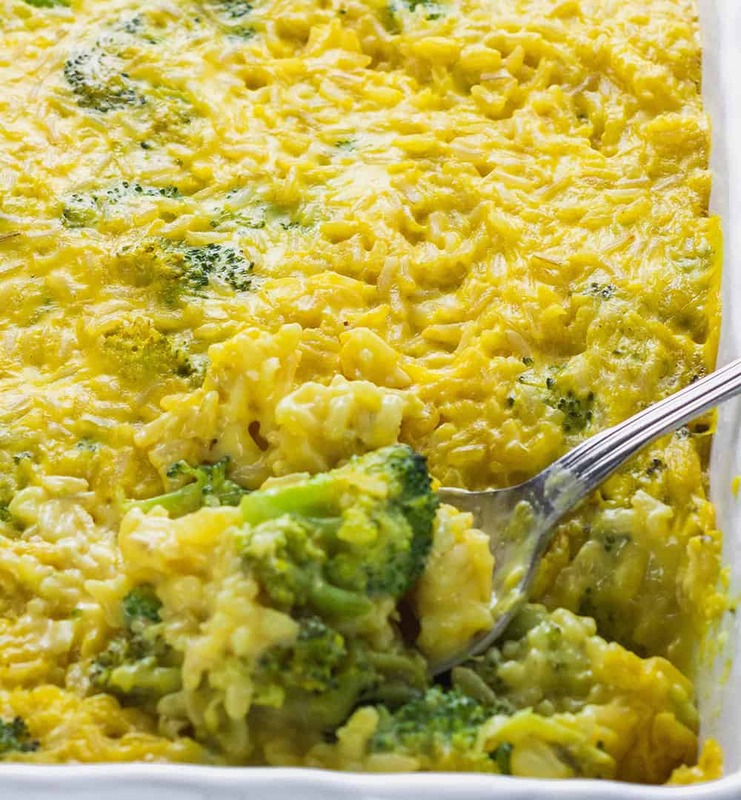 This Vegan Broccoli Rice Casserole is made with nutritional yeast for its cheesy flavor. I used organic brown rice instead of white for its added fiber and nutrients. You can substitute quinoa with the brown rice. 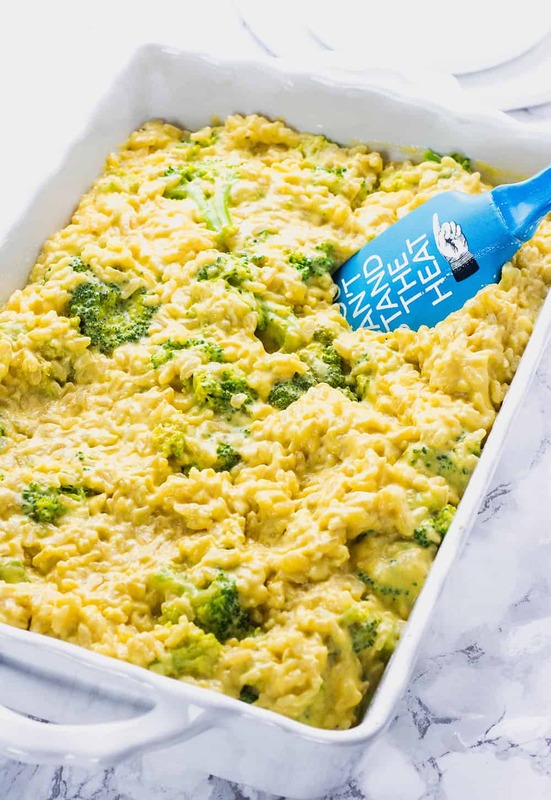 Vegan Broccoli Rice Casserole is that comforting dish that is ideal to serve for a large crowd, that summer BBQ, Thanksgiving dinner, just a perfect way to use up leftover rice and even frozen broccoli. Last week I went to my first Everything Food Conference, it was held in beautiful Utah. If you haven't been to Utah well it is a must see. It was held outside of Salt Lake City. The beauty of this trip is I had my family with me, they basically went sightseeing while I attended the meetings. I met with some awesome brands and the classes by other food bloggers were so inspiring. I basically learn a lot so I can improve your experience here on my website. I also went to so many delicious restaurants. One of my favorite vegan and gluten-free bakery was City Cakes Bakery And Cafe, they had the most beautiful cakes, moist cupcakes, and baked goods. I was like a kid in a candy store, it was so hard to choose from all the tasty treats. I had the most creamy, rich and delicious strawberry parfait, sweet and juicy strawberries, topped with a moist sponge cake and a pillowy soft whipped cream, all gluten-free and vegan. Preheat oven 400 degrees. Lightly spray or brush casserole dish with oil and set aside. Prepare cashew sauce, In a high-speed blender, place cashew or almond and water and process until smooth. Add yeast flakes, onion, tapioca starch, garlic and sea salt and process until creamy. Set aside. Heat a large heavy duty skillet with oil over medium high, saute onion and garlic until soft. Add broccoli florets and cook for about a minute. Add rice and sauce, stirring until fully coated and thicken and fully combined. Scoop broccoli rice casserole into the prepared casserole dish, cover and bake for 35-40 minutes or until slightly golden. 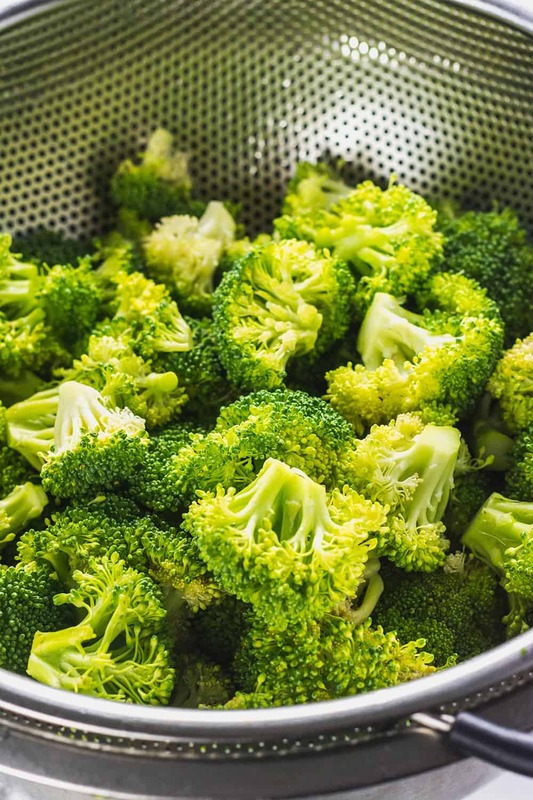 You can use frozen broccoli or prepackaged broccoli florets to save time. You can keep leftover rice in the freezer for up to 6 months, I normally freezer 2-4 cup portions. For this dish, you just defrost rice ahead of time. For the sauce, you can use either cashew or blanch almond. To blanch almond, bring water to boil in a medium saucepan over medium heat. Add raw almonds to boiling water and cook for 1 minute. Drain immediately using a colander and rinse with cold water. Using fingers and squeeze almonds to remove skin. Discard skin and now your almonds are ready. That’s wonderful to know Cynthia, I love that your kids love it. Thank you for sharing your adjustments. Made this tonight served it with asparagus and a salad. WOW soo good. I am picky when it comes to vegan cheesy/creamy dishes but this was perfection. Even hubs loved it. It was exactly what I have been craving. Thanks for the great recipe. I will be looking for others to try from your page. Take care! Hi Jordy, I’m so happy you enjoyed it, thank you very much for your feedback, I’m happy your husband loved it as well. Thank you for trying it. We absolutely love this dish. Thank you for sharing your recipe. I’m very happy you all enjoyed it. Thank you very much for sharing your feedback. I made this for my family l man oh man, that sauce. I have tried several vegan cheese sauce recipes for about a year now and this one is definitely the best, really tasty. Wow that’s awesome Auset, I’m so happy you enjoyed it. Thank you very much for making my day! Okay, you meant you want to substitute the olive oil for veg oil, oh sure you can. Hope you enjoy. OMG Michelle there is only one word or maybe two to decribe this wonderful and delicious dish DEVINE!!!! I love your recipes because for me they never fail even when I tweek them. God has truly given you the gift of creating these wonderful dishes keep up the awesome work!!!? Thank you Janet, I appreciate your kind words, I’m happy it turned out great for you, even with your adjustments. Thank you for sharing your results. I’m going to do macaroni instead. Should I do a cup of macaroni? I know rice is a lot smaller in volume. Just curious your thoughts. I know you might be busy cooking as well. I’ll be smart about it as I whip it up. Hello Kris, guess what that should taste amazing, it would actually be a vegan macaroni cheese with broccoli. I haven’t tried it as yet but I know it will taste delicious, but 1 1/2- 2 cups should work. Please let me know how it turns out. Happy Holidays! Do I steam the fresh broccoli before adding it to the pan? Melissa if it is not mentioned in the directions well no, the reason being, it is a very popular recipe and it is tried and true, cut the broccoli in small florets and there is no harm in steaming it first. I can’t wait to try this recipe. One question about the cashew sauce. Do the cashews need to soak in water before putting them in the blender? 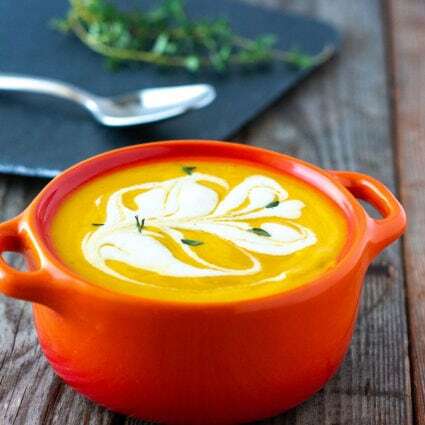 I have seen other recipes recommending boiling them or soaking in water before blending. Hello Sarah if you have a high-speed blender like Blendtec or Vitamix you just need to rinse and blend. However, if you have a standard blender you can soak for at least an hour or use the quick method of boiling the cashews in water for 5-10 minutes. I hope you enjoy, Happy Thanksgiving! I am going to cook the rice ahead of time since it is a blend of long grain rice which takes longer to cook. I always get nervous cooking rice or noodles with the recipe, it never seems to work out for me. What would you pair this side with? In the process of making it now. Jessica, I hope it well for you, I usually serve it with a simple stew like my chickpea stew. I’m making the sauce for tomorrow. My sauce is white, not yellow. Hmmmm……what did I do? Tina I hope you enjoy it, The color of your sauce depends on your yeast flakes and all professional food photographers including myself, post process our photos. I use Photoshop and Lightroom. This is amazingly delicious! One of my all time favorite comfort foods and now thanks to you I can have it again! I made two. One to eat now and one to freeze for Thanksgiving! Thanks! That’s wonderful to know Angie, I’m very happy you loved it. Hope everyone enjoys! Brilliant! Any modifications for freezing and serving at Thanksgiving? Did you freeze the completed casserole b4 the baking step? THANK YOU! Omg I almost didn’t bother to bake it instead of eating right from the pan it wa that good!!! It’s still in the oven and I can’t wait. I literally can’t wait to make this again. Top notch. So glad I found your site. ? Jill thank you very much for your feedback. I’m so happy you enjoy this recipe, hope you try many more of my recipes. Can’t wait to make this tonight! Is it 2 cups rice after cooking, or is it 2 cups raw rice, cooked? What size casserole? I hope you enjoy it Lisa, it is 2 cups of rice that has been cooked, great way to use leftover rice. 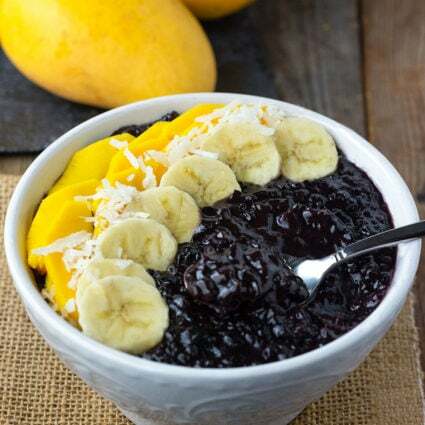 Can I substitute for the tapioca starch? Does this make enough for a 9×13? Yes Jessica it does, the dish is actually a 10×15. I made the recipe this week (added a bit of turmeric for colouring). It says it serves 8, but my sister and I ate the whole thing in one sitting. Yum. ? It’s once of my favourite vegan recipes so far. I’m making it again this weekend. Recipe sounds great as well as your other recipes. Many food allergies. Can you use cooked quinoa instead of rice. Thank you for your reply. Thank you Catherine, yes cooked quinoa is perfect. Marcella, I’m so happy that your recipe tasted pretty good. I was so curious to see how my original photo looked compared to the current one, so I went on Pinterest and search for Broccoli Rice Casserole and I was first of all impressed how appealing my current photo is as compared to the old. The yellow is somewhat brighter but I base it on my improved skills with Photoshop and Lightroom. So yes my current food is way more appealing. I didn’t add anything extra, but if you would love a brighter yellow you could add a pinch of turmeric or yellow bell pepper, hope this helps. Delicious! All three kids (8, 4, and 1 year old) devoured it! Have you had any success making it ahead of time and freezing the casserole for a later date? 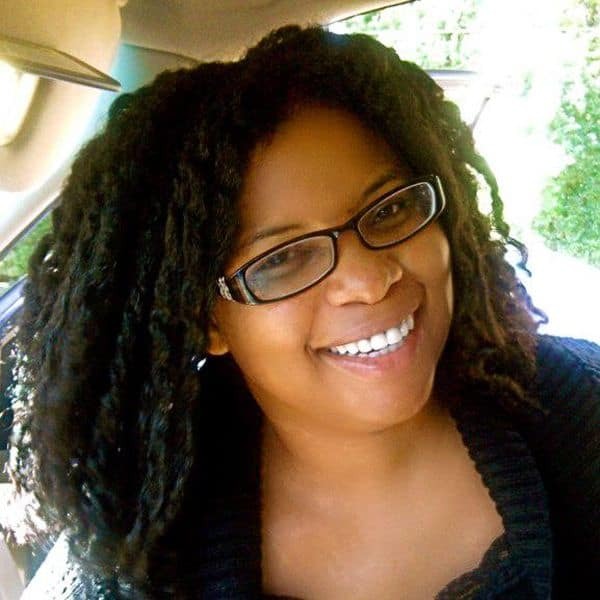 Tracy, I’m so happy that all of your 3 kids enjoyed it. I have never had leftovers in my home, lol so I have never had to freeze it but I have frozen other rice dishes and vegan cheese sauces and they hold up pretty. I made this for dinner this evening and it was very good. The sauce is super. Thank you for sharing your recipe. Deb thank you for your feedback, I’m so happy you loved it. Hello Philly, thank you. I’m also updating old recipes, glad you loved it. Cashews would give a creamier tasting sauce but almond in fine and has less fat. yes… I am glad u r updating. I miss so much of the recipes cause you have so much to try.. This way I will c ones I missed.